Some poems make things simple, recipe-wise. They list a series of ingredients, practically writing the recipe for you, giving your mind a dish before you even finish reading. In this poem, there is none of that. Instead, a single pear, first in the title, then not again until the last stanza, where it's used as a metaphor for the mind in middle age. by your middling mind, afraid. until things have gone too far. Certainly, the passage of time is a strong theme. We all have moments (middle-aged or not), when seemingly out of the blue you realize how fast-paced your life is. Sometimes it hits you in the face, like when you receive an invitation for your 10-year high school reunion. More often though, it's subtle, as the speaker suggests, like when you reach for a pear in the bowl on the counter and realize it has spoiled. That the month is nearly over, another year gone by. It sounds as if the speaker needs a bit of a boost. Someone to say, "it's fine, really." And I can think of nothing better than a cup of tea, a scone, and homemade jam to soothe the soul and make the world a bit more manageable. 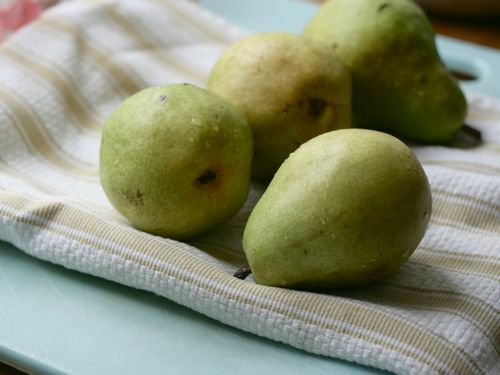 When viciously pureed, the pears take on the consistency of applesauce. Whether or not you peel the pears is up to you; I gave them a rough peel, just to get most of the skin off. Also, if you prefer your sauce slightly less sweet, reduce the amount of sugar. In a 3-quart saucepan, add the pears and sugar. 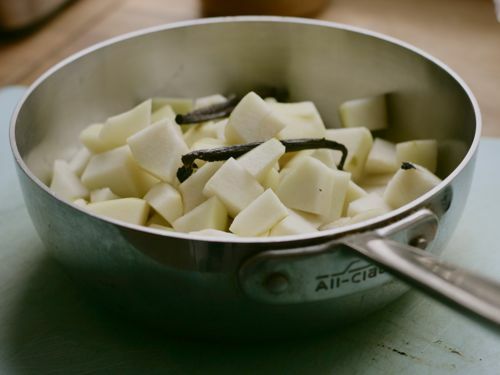 Scrape the vanilla bean seeds out of their pod, then add them to the pan. Toss in the pod as well. 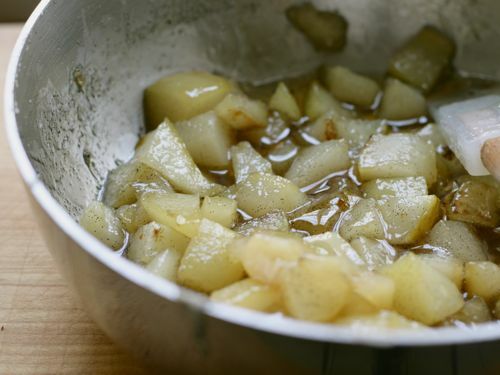 Heat over a medium-low flame for about 15 minutes, or until the pears are soft and masheble with the back of a spoon. Remove the vanilla pod and transfer jam to a food processor; pulse until desired consistency is reached. 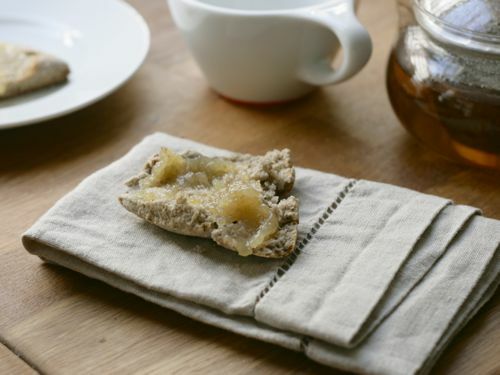 Keep refrigerated, and spread on scones or toast.